During the recent United States presidential election, material embarrassing to candidate Hillary Clinton surfaced in Wikileaks near the end of the campaign. The leak was blamed on “Russian hackers” aiming to influence the election in favor of candidate, and Vladimir Putin fan, Donald Trump. Russian hackers are not the only entity in the news accused of illicit influence. Last year, tech and scientific stars warned that artificial intelligence could eventually take over, everything. Which brings us to pol.is, our featured project in this second installment of the Democracy Series. Pol.is. was adopted by vTaiwan to power their super-competent democracy experiment. Aritificial Intelligence and voting. What could go wrong? Speaking in the present moment, AI appears to obey its’ developers intentions. Pol.is uses AI to deliver true “crowdsourced discussion”. No one’s ideas are buried as they can be in threaded discussion. The essence of super-competent democracy is the ability of government to adopt and implement ideas from the citizenry. Pol.is Artificial Intelligence embeds each commentor’s ideas into the DNA of a discussion. This enables government to evolve rather than distill. pol.is was conceived around the time of Occupy Wall Street and the Arab Spring. We felt if millions of people were going to show up to a conversation, the internet needed something that would scale up. We set out to build a communication system that would handle ‘big’ and stay coherent. We wanted people to feel safe & listened to, and we felt it was of the highest importance that minority opinions be preserved rather than ‘outvoted’. Based on that success, the second and current version of vTaiwan now uses pol.is. Pol.is is a survey technology where the user clicks “agree,” “disagree,” or “pass” in response to statements others have contributed. The user can also enter their own statement for others to take positions on. 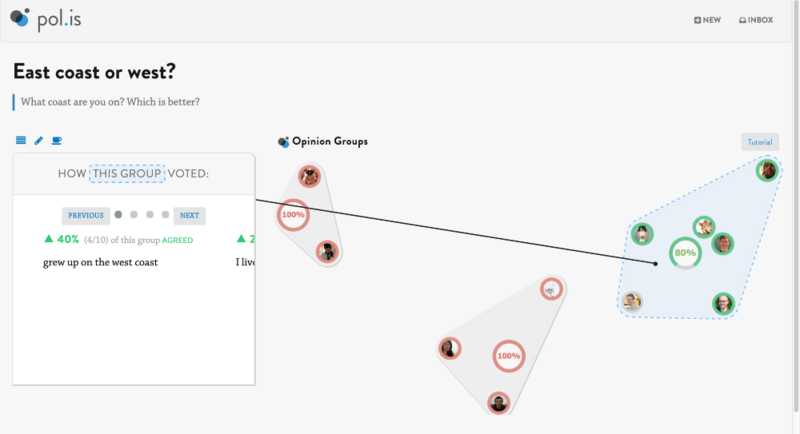 Pol.is clusters users who voted similarly into opinion groups using realtime machine learning (artificial intelligence), and visualizes those groups in real time. Once vTaiwan deployed pol.is, participation scaled a hundredfold, the complexity of issues grappled with increased, and the volunteer moderators were no longer needed during the “crowd-sourced agenda setting” phase. After years of closely iterating with the vTaiwan team, pol.is was recently open sourced, greenlighting its longterm integration into governing processes. pol.is is capable of providing much of the same functionality to researchers that other standard online survey platform do via its ability to present specific ideas or questions to participants and record their agreement/disagreement with them. Whereas this is the limit of other surveying approaches, however, it is only a starting point for pol.is. Though researchers may begin with seeding a conversation with particular prompts and opinions related to said prompt, the capacity of pol.is to then go several steps further inviting participants to react with their own words and then allow other participants to respond and react to those reactions entails that the researchers will not be confined to capturing only the information they thought to collect from the group before they began their study. This same functionality also allows researchers to, in real time, ask further follow up questions to the group on important but unexpected new themes that emerge from the conversation. In this respect, pol.is essentially allows researchers to have, in one tool, both the systematicness of a survey and the sorts of rich, organic observations that are usually found through focus groups or interviews. Beyond this unusual capacity to bridge breadth and depth of individually produced information, pol.is is also able to provide a streamlined way for researchers to quickly look at and digest higher order information on the relationships between individuals and their responses to each other. Specifically, by using patterns of agreement/disagreement to map the space of collective thinking and opinion and then using the actual content of conversations to allow researchers to interpret that space, pol.is proves uncommonly objective in summarizing large amounts of rich social data quickly and easily. Though this “out of the box” functionality does not represent anywhere near the extent of analysis that can potentially be done with the data pol.is captures, it is an unexpectedly sophisticated level of ready-made analysis. First of all, our decision in adopting and expanding pol.is’ engine is based on the above diagnostic that we need to improve our collective deliberation tools in two main complementary challenging aspects. First, the deliberation tool should achieve higher levels of mass engagement in free (as in freedom) collective deliberation. Second, it should foster collective engagement that overcomes the confrontation logic of social media (swarming and campaigns) and enable collaboration between government and society towards common goods. The pol.is engine is well suited to address the first challenging aspect of achieving higher levels of mass engagement because it proposes a seamless and minimalist way of participating. The easiest way people can participate on its engine is just casting a reaction to a tweet-size comment (proposal) randomly selected from all comments submitted. This kind of participation can be completed in less than a minute. In a progressive way, after reacting to a comment, people can keep reacting until they reach the last of the comments or, submit their own perspective as a comment. This new comment will then be part of the comments deck and available for the other participants to cast reactions to. In the pol.is engine, participants can’t reply to a comment. Its architecture does away with replies in order to formulate a matrix of comments and reactions. All the information gave by participants is accounted. Good comments and ideas will not be lost on enormous discussions trees but will be presented as an equal to other participants cast reactions. Discussions architecture like pol.is?—?that we call “Crowdsourced Discussion”?—?are different from traditional forums?—?that we call “Threaded Discussion”. In a “Crowdsourced Discussion” all information given is utilized. In a “Threaded Discussion”, as it depends on later systematization, part of the information (sometimes most of it) is discharged by the process. We’re not specifically advocating for abandoning the “Threaded Discussion” architecture, as we think it’s still important for many deliberation experiences, specially for small-medium groups. But we realize that it poses serious mass engagement limitations. Now, let’s go to the second challenging aspect, that is to foster participants engagement on collective actions. The pol.is engine uses machine learning algorithms to interpret the data matrix built by the comments and people reactions in real-time. That matrix is processed in a way people can be organized in affinity groups based on how they participate on each comment. The information about those group formations is updated in real-time and is exhibited in a way people can had a sense of moving around in a physical, tactile space towards their tribe. That’s very innovative, as the pol.is interface provides a democratic and transparent dashboard that not only the system administration can see but every participant or viewer. Everybody can understand and download the data about the groups that were formed on the discussion, how each comments performed in each group, what were the majority comment within all groups, which group you are in and who are the other group members. As the participant clicks?—?Agree or Disagree, their avatar moves toward a group with similar feelings, and the next statement shows up; everyone can contribute any number of statements for others to vote on. For the UberX survey, we asked everyone to begin their statements with “My feeling is…”?—?and everyone can respond to each other by sharing their feelings in return. We sent all stakeholders the Pol.is survey’s URL at the same predetermined time, to ensure a balanced diversity of participants. Four broad groups of people soon emerged: Taxi drivers, Uber drivers, Uber passengers, and other passengers. Note that 75% of Group 1 amounts to just 33% of total participants, meaning there were more people disagreeing with the two statements above than people who agreed. The government should leverage this opportunity to challenge the taxi industry to improve their management & quality control system, so that drivers & riders would enjoy the same quality service as Uber. (95%, across all groups) . By the fourth week, participants have contributed a coherent set of reflections, expectations and suggestions, successfully forming a coherent agenda for stakeholders to respond to.